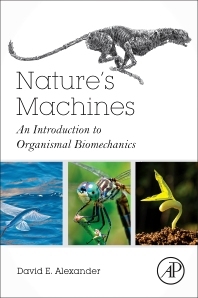 Nature’s Machines: An Introduction to Organismal Biomechanics presents the fundamental principles of biomechanics in a concise, accessible way while maintaining necessary rigor. It covers the central principles of whole-organism biomechanics as they apply across the animal and plant kingdoms, featuring brief, tightly-focused coverage that does for biologists what H. M. Frost’s 1967 Introduction to Biomechanics did for physicians. Frequently encountered, basic concepts such as stress and strain, Young’s modulus, force coefficients, viscosity, and Reynolds number are introduced in early chapters in a self-contained format, making them quickly available for learning and as a refresher. More sophisticated, integrative concepts such as viscoelasticity or properties of hydrostats are covered in the later chapters, where they draw on information from multiple earlier sections of the book. Animal and plant biomechanics is now a common research area widely acknowledged by organismal biologists to have broad relevance. Most of the day-to-day activities of an animal involve mechanical processes, and to the extent that organisms are shaped by adaptive evolution, many of those adaptations are constrained and channelized by mechanical properties. The similarity in body shape of a porpoise and a tuna is no coincidence. Many may feel that they have an intuitive understanding of many of the mechanical processes that affect animals and plants, but careful biomechanical analyses often yield counterintuitive results: soft, squishy kelp may be better at withstanding pounding waves during storms than hard-shelled mollusks; really small swimmers might benefit from being spherical rather than streamlined; our bones can operate without breaking for decades, whereas steel surgical implants exhibit fatigue failures in a few months if not fully supported by bone. 5.5 The Promise of Biomimicry: Have We Arrived? David E. Alexander grew up in a small town outside Dayton, Ohio—less than 20 miles from the Wright brothers’ home—fueling an early interest in flight of all kinds. He earned a B.S. from the University of Michigan in Biological Oceanography, then studied insect flight mechanics for his Ph.D. research at Duke University. He taught biology for several years at Bellarmine College in Louisville, then moved to the University of Kansas, where he has studied the biomechanics of animal swimming and the biomechanics and evolution of animal flight.